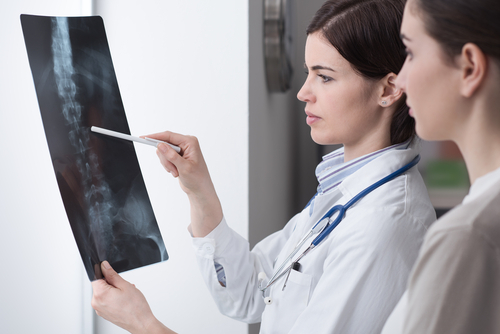 Long-term treatment with TNF-alpha inhibitors improves bone mineral density (BMD) but does not affect the progression of vertebral fractures in people with ankylosing spondylitis, according to a study. The study, “Long‐term Treatment with TNF‐alpha Inhibitors Improves Bone Mineral Density But Not Vertebral Fracture Progression in Ankylosing Spondylitis,” was published in the Journal of Bone and Mineral Research. Ankylosing spondylitis (AS) is a chronic rheumatic inflammatory disease that mainly affects the joints of the spine. Patients have an abnormal bone metabolism that affects bone formation, leading to stiffness and movement impairment. They also show a reduction of bone mineral density, which causes osteoporosis and vertebral fractures. TNF-alpha is a small molecule, called a cytokine, involved in inflammatory responses and bone loss. The use of TNF-alpha inhibitors has shown positive effects in diminishing inflammatory reactions in the spine and increasing bone mineral density. However, the effect of TNF-alpha inhibitors on bone mineral density has only been measured with a maximum follow-up duration of three years. Vertebral fractures are linked to osteoporosis, age, lifestyle, and disease status in AS patients. Therefore, increasing the bone mineral density of these patients could reduce vertebral fractures. However, while previous studies suggested that TNF-alpha inhibitors improved bone mineral density, they did not affect the progression of vertebral fractures. In this study, the researchers investigated the long-term effects of TNF inhibitors on bone mineral density and vertebral fractures in AS. 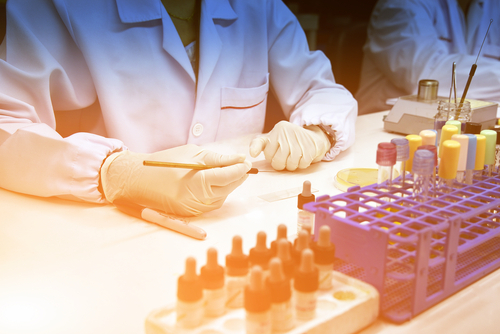 A total of 135 patients with active AS who had not received TNF-alpha inhibitors before the study were recruited from the Amsterdam Spondyloarthritis cohort at the VU University Medical Center and Reade in the Netherlands. The starting date of TNF inhibitor treatment varied from March 2003 to August 2014, and no distinctions were made between different types of TNF inhibitors. Most patients were male (70%) with a mean age of 44.8 years and a mean disease duration of 11.9 years. Patients’ bone mineral density and osteoporosis, the occurrence of vertebral fractures, and other markers for AS were evaluated at the beginning of the study and after four years of treatment. At the beginning of the study, 40.1% of patients had low bone mineral density of the hip and 40.2% of patients had this condition in the lumbar spine. These numbers decreased to 31.8% and 25.3%, respectively, after four years. Disease activity, measured by the Ankylosing Spondylitis Disease Activity Scale (ASDAS) and the Bath Ankylosing Spondylitis Disease Activity Index (BASDAI), also decreased significantly during the study. Nonetheless, the treatment did not decrease the progression of vertebral fractures. At the beginning of the study, 11% of patients had vertebral fractures; this number increased to 19.2% after four years. The severity of the fractures and abnormal bone formation (syndesmophytes) also increased. “The finding that patients still have [vertebral fractures] despite the fact that BMD is improving and patients still develop syndesmophytes under [TNF-alpha inhibitors] treatment is contradictive,” the researchers wrote. “A hypothesis for this finding could be that in patients with [vertebral fractures], bone formation does occur but not comparable with normal bone quality. This makes patients more susceptible to developing [vertebral fractures] despite restoration of bone,” they said. Researchers also found that bone mineral density and vertebral fractures do not seem to be related in AS patients. “Interestingly, only a minority of the patients with [vertebral fractures] had a decreased BMD,” according to them. “Overall, despite the improvement of BMD in the hip and decrease in disease activity after TNFi treatment, we still found new [vertebral fractures], an increase in severity of [vertebral fractures] and radiographic progression during 4 years of treatment with TNFi in AS patients with a long disease duration,” they concluded. Tagged bone mineral density (BMD), osteoporosis, TNF-alpha inhibitors, vertebral fracture.